MobilEyes. For all your laser needs. Breckenridge Colorado Condominium (20% discount to customers) *Please contact MobilEyes to make your reservations. Through years of dedication to the medical profession, MobilEyes has grown to become one of the leading independent providers of laser services in the United States. Our onsite laser repair and maintenance services continue to provide clinics and hospitals with a high quality alternative to the costly and inflexible service structure offered by many of the laser manufacturers. Our consultation services have saved our clients thousands of dollars by providing them with unbiased guidance and support in evaluating and purchasing laser systems and getting complete value from service contracts. Our laser rental service continues to offer expanded income opportunities to doctors that once thought laser medicine was out of reach for their practices. Russell Miller, owner and founder of MobilEyes, Inc., graduated with a bachelor's degree in Electrical Engineering from the Rochester Institute of Technology in 1988. Miller's career spans 20 years of design, development and management in industries from Defense to Environmental to Medical. From a special assignment on the B-1 Bomber with the Eaton Corporation to developing cutting edge equipment such as the MDA Scientific INFRASAFETM optical gas monitor, Russell's passion for problem solving and his ability to persevere through technical analysis and troubleshooting has served him and his clients well. An atypical engineer, Russell began looking for an opportunity to interact more with people than machines, when in 1995 Summit Technology provided the perfect platform. Miller joined Summit, now Alcon Labs, to manage field service operations for the first FDA approved laser systems introduced in the U. S. Market. Miller seized the occasion to develop his expertise in the burgeoning laser vision correction industry and now provides that experience to a growing number of clients nationwide. "Russell takes great pride in his work. Our administration had Russell recondition a YAG laser at one of our satellite locations. Russell not only restored the laser to new condition, but personally made sure that I was happy with its performance." "Russell has tremendous energy. His interests go beyond the machine. He attends conferences, studies the literature, and participates in research projects." "Russell's primary concern is that the laser is in perfect working condition. Russell is truly concerned with the procedure and that patients get the best vision possible. Russell is very meticulous and demanding when it comes to the technical parameters of the lasers he services as well as rents." "Russell Miller is an outstanding, meticulous engineer that knows his business and does a great job." "Since MobilEyes began working with our group over 3 years ago, we have realized improved patient outcomes. It's clear that Russell cares about our patients and our business, we consider him an extension of our staff. And our patients take great comfort with the assurance of a skilled laser engineer present on surgery days to keep the system running at peak performance." 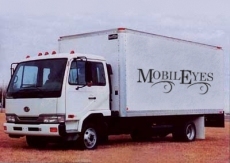 "For over a year MobilEyes has been servicing our VISX and other office lasers. Russell has reduced the overall cost of maintaining our lasers while improving the equipment's performance for our Doctors. His dedication to the task and loyalty to our staff is priceless." "I have worked directly with MobilEyes over the last two years and have found the services and equipment to be superb. The most important element to me is that the owner and operator has an extensive engineering background and personally calibrates the equipment prior to use by the surgeon. My results have been outstanding, and I absolutely notice no difference utilizing a mobile system versus the stationary system in my office. The friendly nature with which his team interacts is unparalleled, and the quality of the service, I would rate at the top 1% of any company with which I have worked to date."